Resident Evil: Gun Survivor 2 oriented as an Arcade title created jointly by Capcom and Namco for Japan. 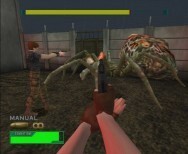 The game was built using the Naomi GD tech from Sega for their Dreamcast, which made perfect sense seeing as the game was built up from the Dreamcast Code Veronica title. The arcade version had some slight load times seeing as it was accessed from a GD, but apparently the advances had allowed some graphics upgrades above what was originally shown on Dreamcast. 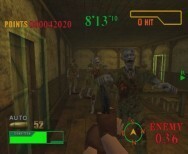 The game also allowed 2 players to play at once, a first for Resident Evil. This said however the title reportedly flopped in Japan. A problem of trying to combine a first person shooter with one that allowed you to move the character. While this was Capcom's second outing on this idea, the first being Survivor on PlayStation, it seemed the idea was lost when brought to the arcades. Which is why I questioned the point of bringing it back home. After playing, personally I do think the problem is less in the fact that moving between shooting and moving is hard (although it still doesn't help-more on that later), but that doing it with a timer ticking down is the worst way you could ever think of pushing someone to play. The game becomes less of a panic because something is coming to get you now and more of a panic because something is coming to get you but you're stuck against this wall, can't turn well, and will be dead in a few seconds. With the original Survivor, there was no timer - you moved at your own pace, and while there was still problems, its system looks brilliant compared. This is why the Dungeon Mode in Survivor 2 is semi-better than the Arcade Mode. You still have a timer counting down, but it's more mission based, less confusing, and seems better thought out than the Arcade Mode was. More close to the Battle Mode of Code Veronica. Back to the controls, Capcom has added six control settings for Survivor 2, and sadly 3 are unusable and the other 3 are just the same thing with one button altered. The conventional movement of Survivor, which by all means was just the Resident Evil control scheme in 1st Person has been scrapped. In it's place an horrible design best described as one based off PC FPS. However as everyone knows, those sorts of designs hardly ever work on consoles. By default you use the Directional Pad to move in side steps left and right and move forward and back, and to turn you end up using L1 and R1. Why? Why was the "draw gun" idea removed? You still controlled like a tank, but you only used one set of controls to do it. When you wanted to shoot, you held R1 and fired away, and to start moving again you released it. With this new system I find myself trying to do major arc's in small hallways, getting stuck against walls more than I ever have in RE title (which says a lot). I have to question the sanity of the person who designed the control setup. I can't even imagine trying to use the G-Con2 and get better at controlling with it's setup (and from looking at the options I'd think the PSOne G-Con would be even worse - but I didn't try that). Then there is the aiming. Of course you would have noted if you decide to use a PC style of movement and shooting that you either add a very good way of looking around at targets or a very good auto aim system. Sadly Survivor 2 has neither. I lost count the number of times I couldn't hit dogs, lickers, spiders, and probably the worst of all - bats. Large enemies are good enough targets, but the small ones and any that climb walls and ceilings are just horrible to try and shoot at. Prone zombies are terrible until they're crawling for long enough, and unlike other RE titles you'll only auto aim things in your screen. More realistic yes, but when it's in 1st person it's the worst thing possible. Thankfully there are markers telling you when enemies are in directions, and their color coded in range. You can switch this off in the options but who the hell would do that? There are numerous other small problems that come up in just the early parts of play - bad translation, no voice acting, silly map design, and the fact there is a "Now Loading" screen even after the door sequences. The game seemed promising enough but then you just get annoyed at having to run everywhere to get a silly key in time. Considering I've vented everything bad, I may as well (finally) get to the good. The first thing is that although the game is based on Code Veronica doesn't mean the developers got lazy. While there was already the biggest amount of enemies in the original Code Veronica, they've gone out of their way to add even more. Lickers make a return, there are Drain Deimos' from Resident Evil 3, and if you don't get a level done in time you'll have Nemesis all over you. All of their models look excellent, making a nice transition to the fully 3D world. There are also plenty of new weapons or weapon bonus'. More launchers, more guns for characters, and plenty to shoot at. Inventory space (if it can be called that) is all set to weapon storage, so you don't have to worry about keys and health, you'll just pick up items as you get to them. There is also a nice set of mini-games, bonus items (including files I believe), and bonus characters beyond Claire and Steve. The ranking system also allows you to try and better yourself through the levels (because of the controls it took me some time to get better-but it does happen). And now we come to the end of it. In short Resident Evil Survivor 2: Code Veronica isn't a brilliant game. It holds too many problems that a purchase is more like wasting cash than spending it, and doesn't hold anything new even for the biggest fans of Resident Evil. For those who can get it from Japan and Asia or the PAL version from Europe and Australasia, I'd advise a rental first if you really want to try it out. Those in the US who can't get the game, don't worry, you aren't missing much here at all.